Procraftination: How tweet of you! Happy Saturday morning! Just a quick post this morning before I head outside to do some pruning. Spring is finally here! I'm playing along in a new-to-me challenge. 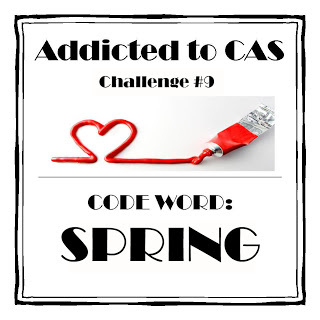 Addicted to CAS (which means clean and simple). This is ATCAS#9 Challenge, and the code word is Spring. I haven't created a whimsical, cute card in a while. And since I was in the mood for something different, this is the result. This was SO much fun to create. And it makes me smile :) I used patterned papers for the log, grass and the sky. I attached the die cut grass to the back of the white panel. All of the other pieces (I fussy cut the log, leaves and bird) are adhered to the card base. I attached the white panel, with grass, using foam tape to give the scene some dimension. Oh, and I added a tiny drop of glossy accents to the little birdy's eye. My intention is to put this card in my Etsy shop. But. I'm not sure I can part with it. I know, crazy huh? Oh, my...it makes me smile, too...and I needed that today! Adorable, Susie!!! This really is such an adorable scene Susie, it's so perfectly balanced! hi there, so lovely of you to join us at ATCAS and with such a super card, I really love this little scene beautifully done ! Thanks so much for playing along with us and good luck. What a gorgeous card Susie - it really made me smile! Wish Spring had sprung over here in the UK......... Thanks so much for joining the fun at A2CAS. Oh that scene is just adorable!! This makes me smile! Thanks for playing with us at ATCAS!